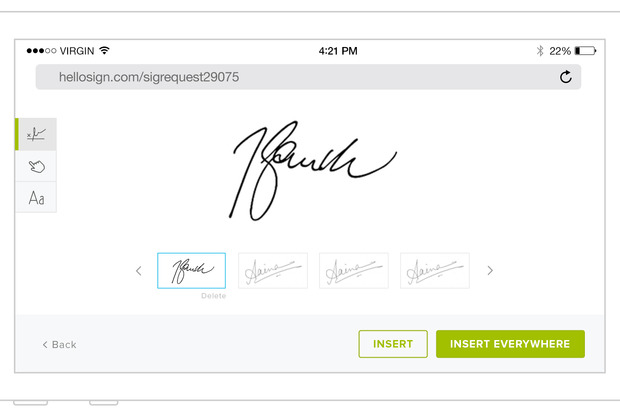 Electronic signatures are at the same time mind-numbingly obvious and an exciting glimpse of a paperless future. HelloSign furthers both those traits. I'm a big proponent of electronic document signing. I spend a huge amount of my time on the road and being able to sign documents from wherever I am is a major relief. There's nothing worse than trying to find a working fax machine in order to execute some documents while traveling in Outer Mongolia (OK, I've never actually been to Outer Mongolia, but trying to use a fax machine pretty much anywhere away from home or the office is a nightmare). I've been using HelloSign now for a number of years and on an almost daily basis turn to the product in order to sign documents or fill in forms. So I was interested to hear from HelloSign about a bunch of innovations that the company rolling out today -- it's a long list and all of the announcements will measurably add to my productivity. So, taking it from the top, what is HelloSign rolling out? Available for any HelloSign user, whether they utilize the free or the paid account, the new signer page offers a simpler user experience and (yay!) now boasts responsive design, meaning that documents can be signed from any device. This was always an issue for me since HelloSign, while great on a laptop, hasn't really been stellar on a mobile device. Alongside the responsive design, HelloSign is rolling out progress tracking within documents to show users how many fields need to be completed in total, and how far through the form-filling process they are at any time. Alongside this progress check, HelloSign now requires all fields to be filled out before finalizing a document, which should reduce the occurrence of partially filled documents. In what will be a huge boost to those who have to sign lengthy legal documents, users can now choose to automate signing across all signer fields. The "Insert Everywhere" option will insert the signature into every required space in the document. To keep the more security conscious among its users happy, users can now assign an access code to any document to restrict access. A new feature means that the requester (the person who wants the document to be signed) can create rules for any text field that needs to be filled out. In practice, what this means is that if the signer enters a letter in a field with set rules that require only numbers, the signer won’t be able to complete the document until the error is corrected. HelloSign obviously only validates the format of the data but doesn't verify the accuracy of the data. But either way, this feature, which is part of the paid HelloSign plans, will give users far more granularity and certainty over form filling. HelloSign now gives customers the ability to customize signer pages with their branding, colors, buttons and text. HelloSign logos can be replaced with the customer's branding. This is an office attempt to get some traction in the white labelled space -- HelloSign's competitors have seen good traction allowing their solution to be embedded within third-party websites and applications with full fidelity around look and feel -- by allowing full customization, HelloSign starts to become more of a document signing and form filling engine, rather than merely a destination site. I have to concur with Walla, all of these improvements will make a measurable difference to my productivity when it comes to signing documents and filling in forms. It isn't, however, quite the slam dunk that HelloSign would like to to be. The truth of the matter is that there are a number of document signing vendors, all in a continual arms race to offer better end-user features in an effort to attract new customers. It strikes me that e-signing is a particularly sticky class of application and that, once people have signed up to a document signing service, it takes a fair amount to make the change. These announcements, therefore, should be seen in the context of HelloSign's eagerness to attract new customers without an existing provider. If you're doing due diligence on a range of vendors, it seems to me that the ability to sign in all places within a document and the ability to assign specific requirements to particular fields in a form are small but crucial points of difference. As such, this release will, in my view, do good things for the size of HelloSign's customer base.